Every household needs a globe, especially one as detailed and versatile as this, that includes geography in fascinating relief as well as national and political boundaries (visible when the globe is unlit), calibrated meridian, time dial, raised equator, and sturdy no-tip base. Switch on the soft interior light to reveal Earth's geography, including mountains, rivers, and underwater ocean topography. Makes a fun night-light for the whole family. B is very interested in Geography and different destinations. Now that he's in school he has gained a new love for maps....he loves to sit and look at all of the places in the Country and World......he's genuinely fascinated by it all. 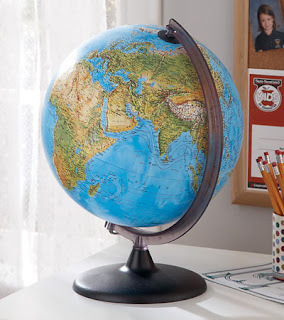 So while browsing through Hearth Song's online Holiday Catalog the Orion Relief Globe immediately caught my eye! This beautifully detailed Globe looked gorgeous in the catalog, so we couldn't wait to see what it looked like in person! The Orion Relief Globe is just as detailed as described and even more beautiful in person! Our absolute favorite feature is the soft interior light which provides an incredible glow in the room at night. B has spent the past few day's staring at it in awe when we turn the light on at night! For amazing one of a kind (many exclusive item's) gift's this Holiday Season check out Hearth Song, I'm sure you'll be just as impressed with their offering as we are! We've found our new favorite store! Experience the whimsy of the beautiful lighted Orion Relief Globe! One lucky reader will receive a Orion Relief Globe! Leave a comment~ Visit http://www.hearthsong.com/ and let me know another product that you would love to gift or receive this Holiday Season! The comment is considered your entry. I love the Spiro Hop, it is perfect for the backyard. I'd love to gift the Magneatos 72-Piece Set. I would love to gift the Star Theater 3 for Christmas. I love the Young Archer set. My daughter would love the Dance With Me Fairy Doll! I entered the Toshiba Giveaway. I like HearthSong on FB - Cari S.